A unique feature of coral atolls is that many have a ‘lens’ of freshwater, ‘floating’ on denser brackish water. This very thin and fragile freshwater resource relies on being regularly recharged by rainfall. The freshwater lens moves up and down with the tidal patterns of the ocean, and it is not unusual for freshwater to be pushed up above the ground through the porous coral during extreme tidal events, such as the spring king tides. Under the Tuvalu Aviation Investment Project (TvAIP), the 20-year-old runway was resealed to repair cracks and extend its service life. 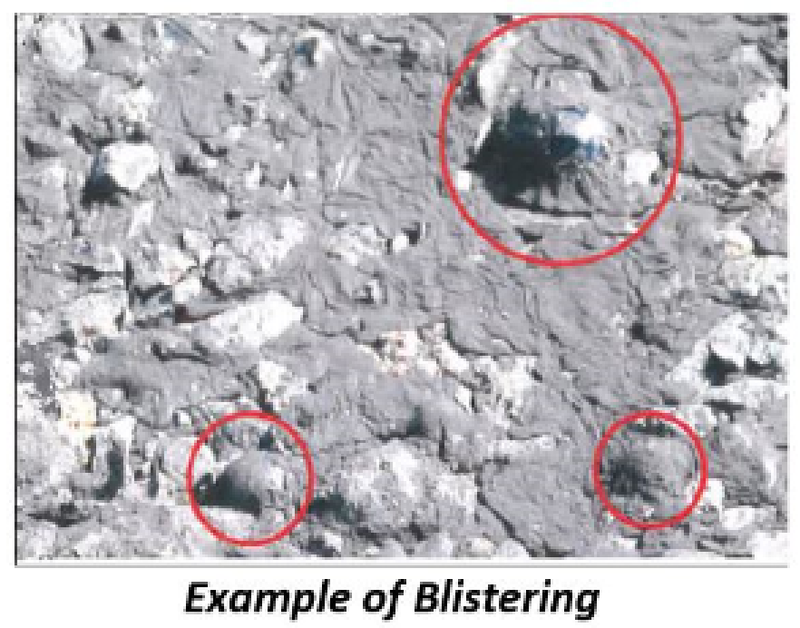 Within six months, areas of the pavement began to ‘blister’ and vent cracks formed, which led to pavement ‘heaving’—that is, lifting and breaking. Coral is porous and the up and down movement of tides pushes air and moisture towards the surface. With nowhere to go, it eventually forces its way through the surface. Here is a video showing air bubbling up through the ground next to the runway. This type of pavement failure is very rare, and there appears to be only one documented similar case at Hong Kong runway. Heaving of the runway surface due to tides was observed almost directly following the opening of the new airport in 1999. There were no problems observed with the surface of the resurfaced road in Tuvalu, which was sealed at the same time as the runway. One theory is that this is because the road, at only 7 m wide, allows the underlying pressures to dissipate to the sides – this is impossible for the runway which is 30 m wide. To confirm that the distresses were due to vapor pressure under the runway, with funding from the Government of Japan through their ‘Quality Infrastructure Investment Partnership’, the University of Auckland undertook detailed measurements of pressures within the pavement. The figures below show the pressure measurements from below the pavement. The figure below shows how pressure ‘spikes’ (yellow) rose after rainfall (blue). The spikes were greatest when high tides coincided with heavy rainfall. Even though pavements are heavy, and the surface is bonded to the base, the pressure spikes are sufficient to break the bond and lift the pavement. One important question arising is why did this not happen after the 1992 sealing of the runway? 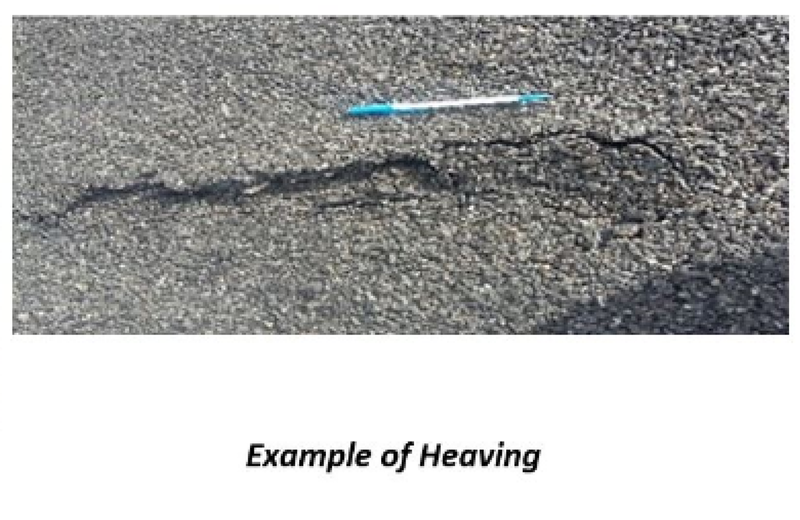 It too provided an impermeable surface, but, while there was some evidence of localized distresses, there was nowhere near the extent and magnitude of the pavement failures as observed after the 2015 resealing. Using the average sea level rise of 5 mm/year since 1993, the intervening period would have seen an increase in the average sea level of some 0.12 m. One theory is that this difference was sufficient—particularly when coupled with the king tides—to create pressure spikes which exceed the weight of the pavement and the pavement/base bond. The most important lesson is that Tuvalu demonstrates how climate change will be placing new and unexpected stresses on transport infrastructure. As a result, we are going to have to try to expect the unexpected. 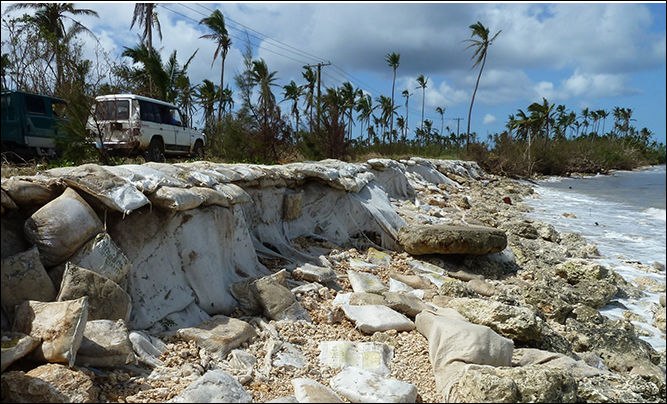 Coral atoll subgrades will always be highly permeable. Other natural aggregate pavement layers will also likely be permeable. Therefore, the end product is a permeable structure that will allow water table movement to rise up to—and eventually through—the pavement surfacing. Having a water-tight surface layer therefore does not work. The combination of the occurrence of rainfall and high tides result in increasing water and vapor pressure below the surface. These pressures are sufficient to lift even thick asphalt surfaces, such as been the case for the Hong Kong airport. If the pavement is well bonded to the base, you may also have basecourse failure. You need to relieve the pressure from below the surface. Sufficient subsurface side drains are also needed to promptly remove water away from the pavement. The Bank is now preparing an additional finance to address the issues observed. The plan is to test several different potential solutions and then construct the most cost effective one. We don’t want to keep landing on ‘floating’ runways. Few things are more depressing than seeing the damage caused by cyclones on transport infrastructure. Especially when it is a causeway that was only formally opened less than one month before the storm. That is what I found in early 2014 when participating in the Tonga Cyclone Ian Post Disaster Needs Assessment. The cyclone was a typical example of the heavy toll that climate change is taking on transport infrastructure, particul arly in the most vulnerable countries. Engineers are taught that water is the greatest enemy of transport infrastructure, and unfortunately climate change is leading to an increase in floods and storms, especially within the South-East Asia region. For example, the figure below shows the number of floods and storms for some Asian countries between 2000 and 2008. The significant increase in the number of floods is self-evident. Air New Zealand as always excelled themselves. It is by far the best airline in the world. I was travelling from Washington D.C. to Fiji via San Francisco and Auckland. While in San Francisco I learned that my wife’s sister had died in Australia which meant that Fiji was off and I made arrangements for me to travel to Sydney instead. The problem was my bag which was checked in for Fiji. Air New Zealand arranged for it to be retagged manually to Auckland; and in Auckland they again retagged it for Sydney. With so many opportunities for error I was not optimistic that my bag would make it. But as soon as I turned on my phone I got the message below that my bag was in Sydney. How? TrakDot. TrakDot (www.trakdot.com) is a small device which runs off 2 x AA batteries. You put it in your bag and when it is in the vicinity of an airport it sends a message via e-mail and/or SMS to a list of contacts you provide. I have my wife on the list so she knows that my bag has arrived—and so in theory so has the husband. For only some $60 and a small annual fee, it is great for peace of mind. More than once I’ve arrived somewhere and got the message my bag was elsewhere and so I didn’t waste time needlessly hanging around the baggage claim area. One time our local airport rang to say my bag was there but my wife said I was on the way already since I knew the bag had arrived. She was surprised—and impressed. 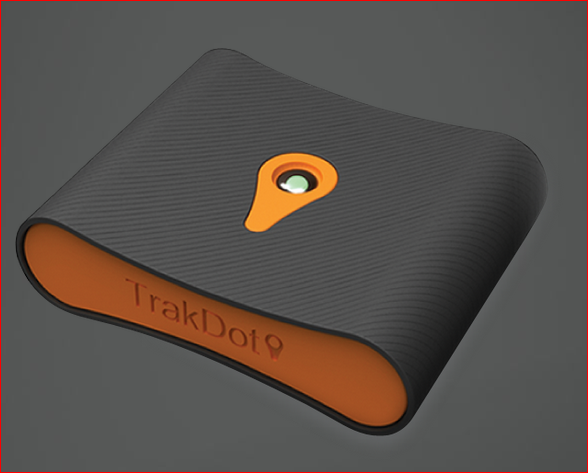 So if you are a frequent traveller get a TrakDot—you won’t regret it. And also fly Air New Zealand whenever you can! The World Bank does not usually get involved with recovery efforts immediately after a natural disaster such as Cyclone Pam. Our strengths are in the reconstruction phase. They differ insofar as the recovery phase focuses on the immediately needs after a disaster: food, water, health, basic shelter. The reconstruction phase is about building back—hopefully better—and helping life return to a semblance of normality. However, since I was on the ground immediately after the disaster, I had a front row seat on the recovery and it can best be described as graduate school on steroids. Both myself and my colleague Nora—who is planning for a career in post-disaster logistics—learned a lot and I’m grateful to have had the opportunity to be in Tuvalu at such a critical time. Cyclone Pam was a Category 5 storm whose 280 km/h winds caused massive devastation in Vanuatu. I departed Vanuatu a few days before the storm for Tonga—after having completed preparation of an emergency project to address issues at Bauerfield International Airport in Port Vila—where I was working on a project rebuilding Ha’apai after last year’s Cyclone Ian. From there I was travelling to Tuvalu which, since being outside of the ‘cyclone belt’ I did not expect to be affected much by the storm. 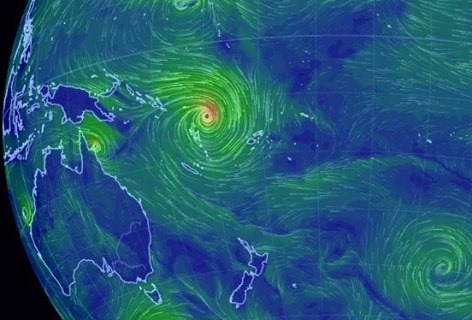 My Tuvaluan friends say that cyclones are created in the waters of Tuvalu but are a gift to their neighbours. This time they were unfortunately wrong. So my planned mission to review the aviation project turned into a post-disaster ‘Damage and Loss Assessment’ (DALA) mission which would help identify potential support for the World Bank after the disaster.